Jesus Christ had many disciples. Among them were twelve he called Apostles. He commissioned them to forgive sins in his name, to teach all people and baptize them. The Bible reports that the first twelve Apostles were joined by others. They discharged the same commission and were endowed with the same authority. 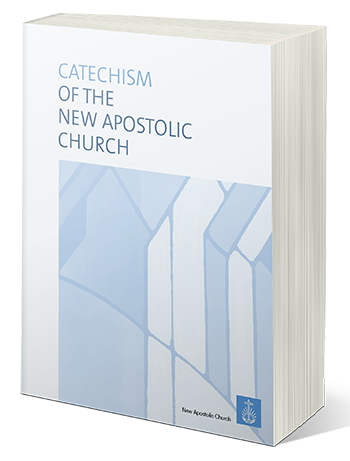 In our time too- no less than in the first Christian congregations, Apostles fulfil Jesus Christ’s commission. They proclaim the will of God, baptize with water, dispense the Holy Spirit, forgive sins, and celebrate Holy Communion with the faithful. The Apostles are assisted by ministers acting in an honorary capacity. As did the first Christians, so too New Apostolic believers prepare themselves for the return of Jesus. Joyful anticipation of eternal life with God is the hallmark of their belief. The birth of a human being is always a miracle. Yet right from his first breath, his death-sooner or later- is pre ordained. In the beginning, things were not that way and in the future, they need not be so for everyone. Man was created by God; from him he received spirit and soul. Man was intended to live with God forever. However, because man sinned- that is, he acted against God’s will- this bond was broken. Man became mortal. Because of his love for humankind; God sent Jesus Christ, his Son, Jesus lived free from sin in total harmony with God’s will. He died of his own free will, intending by his sacrificial death to lay the foundation for the redemption from sin. His resurrection proves his conquest over death. 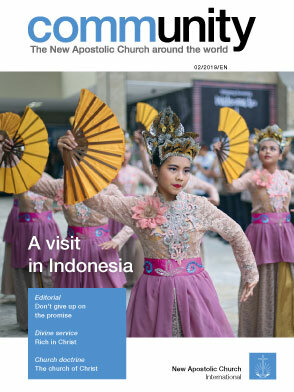 Copyright © 2019 The New Apostolic Church. All Rights Reserved.